Thank You Tapers & Uploaders!! I'm asking about two different shows. Can some people offer up their opinion of these? The first one only says "FM Broadcast"
I am including a link to download a song from each show if you wish to test those. I really appreciate the help with this! Thank you!! Last edited by Zoooma; 2017-05-01 at 10:33 PM. Re: Is this lossless or lossy? I Decoded them to WAV and ran them through Traders Little Helper to see what they say. The one called Track 10 - "looks like MPEG with probability of 95%"
The one called Icehouse 08 - "source of track cannot be qualified"
Doing some reading, it seems like TLH does a good job verifying lossless files, not so good with lossy ones. So take all of this with a grain of salt! Last edited by dorrcoq; 2017-05-01 at 11:45 PM. Thanks for your input Dorrcoq. Appreciated! I ran through Trader's Little Helper, too. A different Icehouse file comes up with 79% probability. but I learned if it's lossy it has a clear cut off point. While Icehouse does go beyond the red line to 22 KHz and the Track 10 does go beyond the red line but not much and not all the way to 22 KHz. But neither has that clear cut off. Could Track 10 be lossless but show up like that because it's from a 1980 FM Broadcast? Yeah, Looking at the spectograms I thought at first both were definitely lossless. The FM source will cut off sooner than the other one (16 kHz or so). I just noticed there's a Sub Forum where this should have been posted. Whoops. Anyway -- anyone else have an opinion, please? Not discounting Dorrcoq at all, but would love to hear from someone else who knows their stuff. Help me learn! By the way, the Icehouse is a 1988 SBD with unknown lineage. If that matters. Can a lossless soundboard look like that? Could each be as lossless as it gets? The 1980 FM especially, assuming it went Radio ->Analog Cassette -> digital files? I'm downloading now, will test them with EAC and will report back shortly. HF roll off isn't necessarily indicative of lossy data compression. Some MP3 encoding schema will do a low pass filter as part of cutting data, but not all. It just isn't a good way to determine if the audio has been through a lossy compression algorithm. To tell for sure, you need a real spectrum analyzer that will show you the aliasing that happens with lossy compression. There are plenty threads here in the help forums with examples. Generally, using Adobe Audition or Cool Edit Pro 2.0+, you'll want to examine a 2 sec slice of audio to see if aliasing is present. This could be an FM broadcast. They roll off around 15kHz in the US FM stereo system. The energy shown above that could be harmonics or just reception noise. There's some popping evident, which could be coming from a variety of things. Someone transferred this with an analog cable, near a CRT with the flyback running at 15.734 kHz (NTSC spec). You can see that in the spectrum. It bled in. 1st one is a lossless recording. This one is lossy. For sure. Looks like MP3. 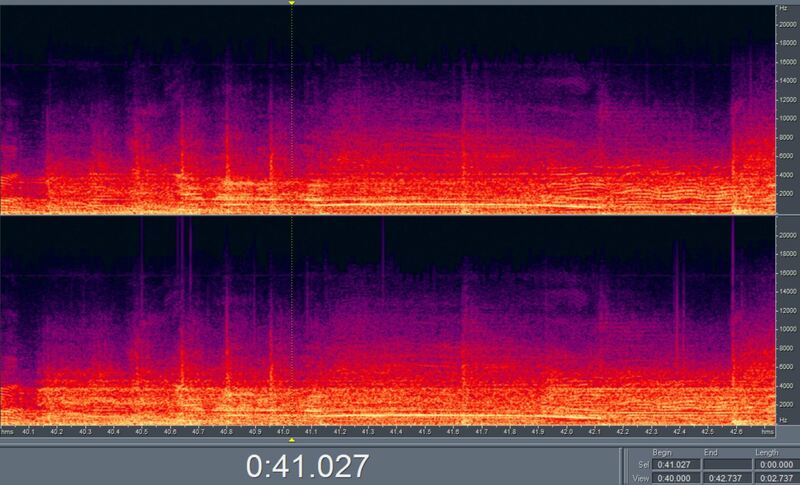 You can see the chunks of data missing and hear the edges of the holes, when listening. 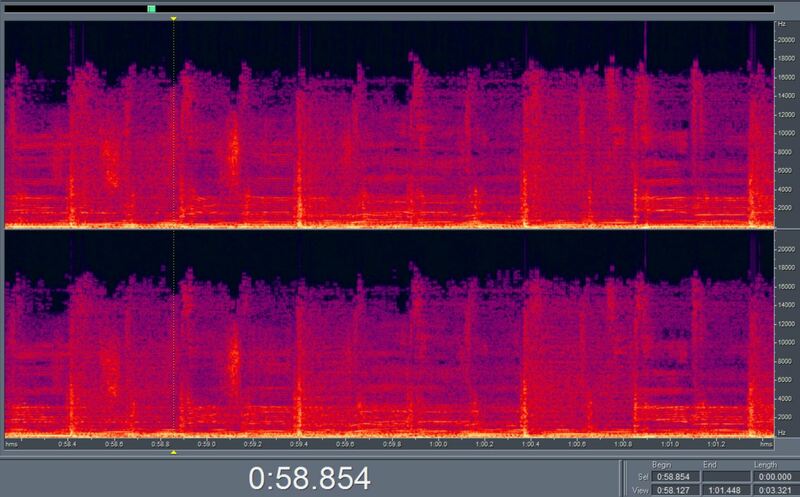 This is what the 'glassy' effect of lossy audio sounds like. It's not bad MP3 but it is certainly noticeable, to me, when listening. You can sort of see these blockies with the spectrum you posted but it's much more evident with the spectrum analyzer in the Adobe apps. I always run questionable files through a EAC test program, which shows a color spectrum. Depending on what colors you get, indicates the amount of compression. The color you don't want to see is "Black", the more black, the more sound loss. Then you can also see the graph. The blue and red lines should travel straight across left to right, If the graph lines slope down, there is compression present. You can see in hertz range when the lines drop, that indicates sound loss. I've tested both tracks. and through my experience reading these results. I see compression to some extent in both. The icehouse track shows more compression, while track 10 contains a smaller amount of compression. Track 10 would barely pass by my regular standards, but icehouse fails this test. I've added pics of both. you can clearly see Blackend areas on each.sorry i wish i knew how to explain it better. frequency analysis isn't really indicative of anything related to lossy data compression. Room acoustics, mics, recording system (or transmission system, if recording a broadcast" can all show HF roll off. It is not, by itself, indicative of lossy data compression. There are MP3 encoder settings that don't roll off much, if at all. Still chunks of data missing. A good spectrum analyzer is the only good way to be sure if something has been run through lossy data compression, like MP3, ATRAC, etc. "frequency analysis isn't really indicative of anything related to lossy data compression. " Just the opposite, that's exactly what it's doing, a frequency analysis does show you where and how much sound is missing data created by compression. It's a perfect way to test and read what's lossy or not. Excellent, good stuff, thank you, sirs, I appreciate each of you contributing!!! I always go on faith that everything's lossless. Almost everything I get is from what should be a reliable source. Almost everything. the Icehouse I got from someone when he let me raid his collection. He gave no mention of any lossy source in his lineage. that someone emailed me back a little upset. so it's good to learn this stuff! no, it is not. And that's not what it's showing you. I posted the reasons why right in this quoted post. FM radio does compress bandwidth somewhat in order to fit on a single radio frequency (I may not have that technically correct), so an FM broadcast recording could look like mp3 compression. I have some stuff I taped off the radio back in the day. I'll run it through TLH and see what it says. Edit: checked two tracks, and it said they look like CDDA with 100% probability. I assume that means ripped from CD?